She reminds me of Maria Shriver. sure she's eating all day long. i can't imagine having to manage and deal with 5 kids (?) while starving yourself. I am very active. I found what works for my body – everyone’s body is different and I think it’s best to find what works for you. For me it’s Pilates and dance. My diet is 80 percent vegetarian and I eat all day long. I have lots of little meals; it’s best for me. I found eating three big meals I felt too full and got tired especially after lunch. I eat lots of fruit, veggies, egg whites, oatmeal, a little chicken, eggs, rice – that’s mostly my diet. I do splurge on ice cream and I love pretzels. My abs get the best workout with my Pilates reformer – I had two C-sections and it was the only thing I found that got my tummy flat. Turning 40 I honestly feel better than ever. I feel more confident with my body than I did in my 20s. … says 42 year-old Denise in Self magazine. Honey, your face is busted. Eat a cheeseburger. Also she has no waist, all she needs now the the bobble head & she's the usual Hollyweird blond bimbo. I saw these shots yesterday on Huffington Post when they said something like, "Denise Richards' Unreal Bikini Body". I have to admit, I was disappointed by how thin and untoned she looked. I'd rather see someone thicker and more muscular -- to me, that's the sign of someone doing things in a balanced, healthy way. It's pretty bad when your arms are the same size as your 9-year old daughter's. She's had lipo and she's not eating much. On the other hand, kudos for taking on Brooke's kids as well as her own. her back is disgusting. except for the bolt ons she looks like an 11 year old child. When your calves are as wide as your thighs, you're not eating enough. If she eats all day long, which I doubt, it's probably leaves of plain lettuce she's munching. She is in great shape at 42 thanks to sticking to a strict workout routine. But it seems Denise Richards may have overdone the exercising. The actress showed off sinewy arms as she took daughter Lola Rose shopping at the Brentwood Country Mart on Tuesday. Dressed in a black tank top, veins on the former Bond Girl’s arms were bulging as she carried her purchases. The mother-of-three appears to be doing her best to ensure her children are active and bought them toys that will keep them on the move. Denise was seen loading two colourful skateboards, as well as another bag full of gifts from Toy Crazy into her SUV. Meanwhile her eight-year-old Lola Rose, who is the middle child, skipped to the car while carrying three large rainbow bright hula hoops. Denise was dressed casually and teamed her tank with boyfriend jeans and black flip flops. The gorgeous star wore her honey blonde hair in a braid on one side of her head and completed her look with large sunglasses. Meanwhile Lola looked adorable in a white top with a heart motif, tie-dye shorts and navy trainers with pink laces. Lola’s father is Charlie Sheen. Denise also had daughter Sam, nine, with the actor and is mother to Eloise, two, who she adopted as a single parent. While Denise sweetly bought her youngsters some exciting new toys, she also found time to treat herself. The World Is Not Enough star was spotted looking at products in beauty store Space N.K. 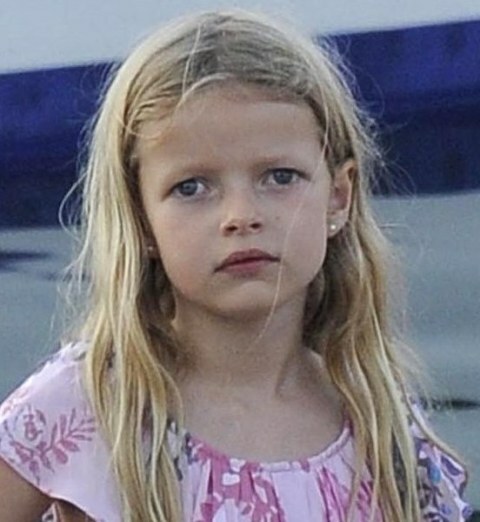 "It seems that eight-year-old Lola has inherited her mother's good looks". That little girl looks like Apple with Theresa's hairline. That's all I'm saying. ConstanceSpry and ManxMouse like this. I think Denise looks a little better in those recent pics with the black top on even tho she has SJP and Madonna arms. Also I don't like to rag on kids in general but because she is Goopy's daugher I have to say wow I feel sorry for her as she looks like her ugly mother.